As I have started taking my running habit more seriously over the last couple of years, I have been trying to improve in every way possible. While the formula for improving as a runner is simple: "run more", the challenge of scaling weekly mileages and run difficulties without injury is very complex. In addition to strength training, proper nutrition, post-run massages, and careful mileage increases, another way to improve as a runner is to optimize running form. 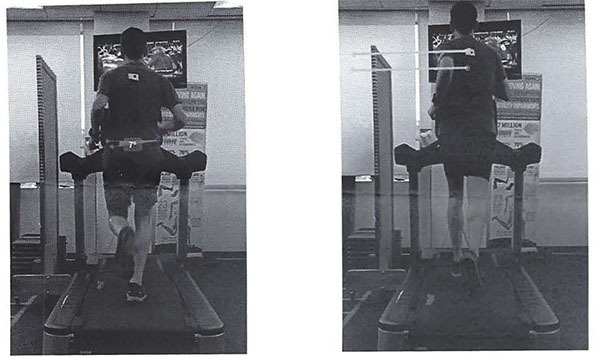 Improved running form offers two advantages: 1)it lowers injury risk by ensuring that improper form isn't putting too much stress on any part of the body, and 2)it improves running economy allowing for longer distances with reduced effort. 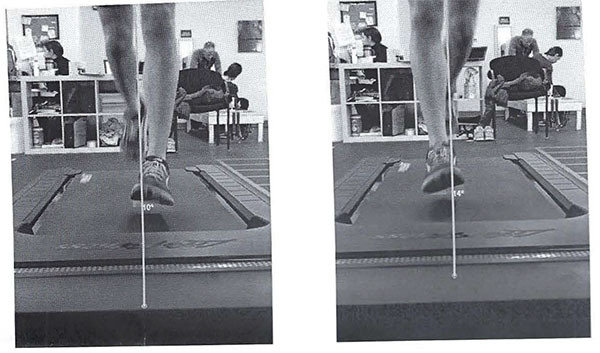 As I am currently between marathon training cycles, I decided that now would be a good time to go in for a video gait analysis. There aren't a lot of options for video gait analysis in Chicago, and I ended up deciding on Athletico simply because it is the closest to where I live. 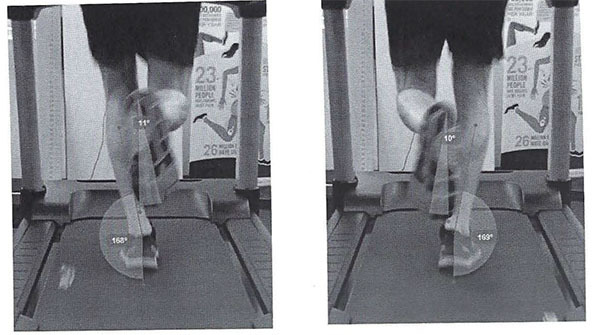 The video gait analysis cost $150 and consisted of two one hour sessions with a Physical Therapist. During the first appointment, the PT asked questions about my running history, how I warm up and cool down, and did some basic strength and range of motion tests. 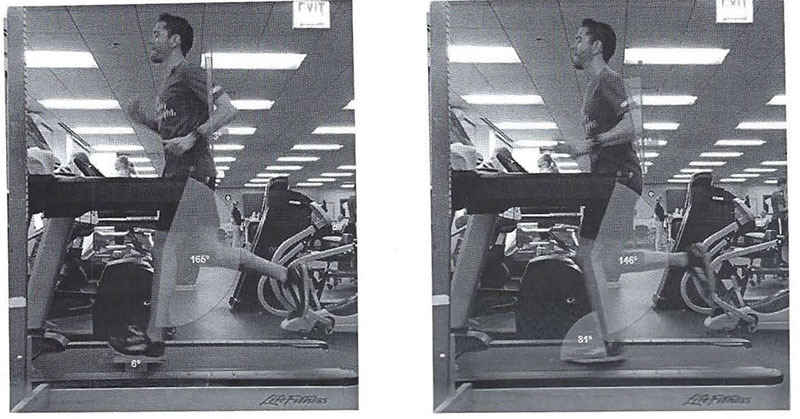 We then moved to the treadmill where he filmed me running from multiple angles for about 10 minutes at a pace consistent with what I would do for a moderate run. During the second appointment, the PT walked me through the results and what I can do to correct the findings. Many of the corrections involved various exercises which I then performed under the PT's supervision, ensuring I was doing the exercise properly along the way. Below is a summary of the findings from my report, and here is the full report. The report is broken up by the angles that were filmed, with annotated photos showing form deficiencies. Explanation: My hip/pelvis is dropping below the ideal range of 4-6° potentially putting more stress on my hips and knees. While I am just above the desired range here, this finding is particularly interesting since I have struggled with knee soreness over the last several years of my running career. Explanation: My feet tend to roll inwards on landing beyond the desirable amount of less than 10 degrees. Explanation: My cadence (steps per minute) is 164 and below the desired range of 170-190. This means that my feet are reaching with every step resulting in an increased impact with the ground that can result in pain particularly in the knees. I question the result of the cadence as my watch also tracks this and a quick look at my strava profile suggests that my cadence was about 179 during my last race, and about 169 during my easy runs. That being said, while I've worked hard to increase my cadence and put an emphasis on landing mid-foot, there is at least room for slight improvement here. Explanation: Due to a weakness in my hips, I am landing on the outside of my feet. This finding is particulary interesting given that I've struggled through all sorts of pains in my right ankle, foot, and particularly my fifth metatarsal (pinky toe bone). Prescribed Exercises: Hip strengthening (see above). Overall I was happy with the analysis and while there were no earth-shattering revelations about my running form, the analysis reinforced some areas where I already knew I needed work, and added several new exercises for me to improve some of my weaker muscles. I finally had the chance to revisit some photos that I took during a June trip to New York. This is likely the last shot i'll post from that series, and one I got from Pier 45 along the Hudson. The last photo that i'll post from my June trip to New York. This is Pier 45 along the Hudson. In addition to the running, I did lower body and core weight training twice a week in addition to some injury prevention exercises (PT band/proprioception). I did no cross training. It was an emotional week leading up to the race. On Wednesday morning I got a call from my Mom that my grandmother wasn't doing well and was in the hospital. I went to visit her that morning in what would be my last time with her as she passed away on Thursday morning at the age of 92. It's been a sad few days for my family, but I'm grateful that my grandma lived such a long and happy life. She has been on my mind for much of the weekend, and memories of her got me through some of the tough miles during the race. In addition to a new training plan, I paid a lot more attention to my nutrition during this training cycle. 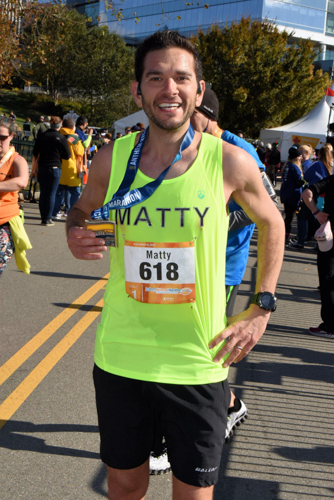 Having read Matt Fitzgerald's The New Rules of Marathon and Half-Marathon Nutrition and Racing Weight, I followed much of his advice. First, I lost a few pounds and got myself down to about 150lbs(68kg) - I'm 5'10"(178cm) - by eating lots of fruits and vegetables, healthy meats, nuts and seeds, whole grains and reducing my intake of sugar and other processed foods. I also eliminated caffeine starting 10 days before the race to maximize the benefits of the drug during the race. Finally, I did a 10 day fat-load (66% of calories from fats) followed by a three day carb-load (75% of calories from carbs) before race day. While carb-loading before a marathon is a well-known practice, fat-loading is not. While carb-loading maximizes the body's glycogen stores, fat-loading optimizes the body's ability to burn fat. According to Fitzgerald, studies have shown that combining a fat-loading phase with a carb-loading one gives endurance athletes both maximum glycogen and fat-burning power. While I felt confident in the science behind the practice, I violated one of the most important rules of racing, never try something for the first time before a race. I woke up the morning before race day with some bad GI distress. This sucked, both for the obvious reason that I had a race the next day, but also because I had a flight followed by a two hour drive to get from Chicago to Richmond. When we finally arrived in Richmond and settled in, seeing me suffering, my wife urged me to get some Imodium for my stomach issues. I made a pre-race evening jog of it, and ran to the drugstore securing some Imodium which would end up being my savior for the trip. I'm still not sure what caused my sickness but my suspicion is that either my body did not react well to carb-overload after carb starvation, or I just overdid the carb-loading portion of the diet. I always like to have just a few extra bites of pasta two days before the race to make sure i've gotten all the energy build-up I can and that might have just been too much food for me this time. Having taken a 5:30am flight into Richmond on Friday, I was so tired that I managed to fall asleep around 9pm the night before the race. I woke up at 4:45am (3 hours before the race) and immediately had my pre-race breakfast of homemade oats/nuts/raisins cereal with almond milk. I drank a total of about 750ml of water starting from when I woke up until an hour before the race. I added two more Imodium to my drug cocktail which would also include 200mg of caffeine an hour before the race and 500mg of Acetaminophen 30 minutes before the starting gun, the latter two at the suggestion of Fitzgerald. Lastly, I had my first gel 2 minutes before the start of the race. My plan was pretty simple, stay with the 3:05 pace group, and if I felt like I still had some gas in the tank towards the end of the race, try to get a bit of a buffer to ensure qualification for Boston. Prior to the race, the 3:05 pace coaches sent an e-mail to the pace group stating their plan which was to go even splits the whole way. Miles 1-3: The pace group consisted of 20 or so people, and knowing that it was a very windy day, I selfishly tried to run behind someone at all times though I would end up doing my share of wind-blocking for a a good portion of the race as well. In 2010, when I bonked in a marathon, I knew right away that my pace was just too fast but ignored the early signs. While I didn't feel like I was going to bonk at this pace, it wasn't super comfortable either. As long as my stomach held it together, I figured I had about a 50/50 chance of hitting my 3:05 goal. Miles 3-11.5: The rolling hills of the Richmond course were...rolling. I kept my thoughts positive though, really making sure I wasn't taking the brunt of the heavy winds which were in our face for most of these miles. Despite this adversity, I was starting to feel pretty good. Mile 12: By this point in the race, I had come to find myself drifting ahead of the pace group several times, having to remind myself to get back with the group. Having mindlessly drifted to the front one last time, it was at mile 12 that I decided I had the fitness to hit my goal and it was time to step on the gas and leave the pace group behind. Miles 13-18: I was finally on my own and now and just running by feel. I stepped it up to about a 6:50/mi (4:14/km) pace. It was during these miles that I learned that I had definitely had the fitness to hit my 3:05 goal. There were several brutal stretches running into the wind including one particularly bad one over one of Richmond's bridges. I kept the thoughts positive. My legs felt great, my breathing wasn’t too heavy, but I had some brutal intermittent bouts of cramping in my sides and upper stomach. Cramps are rare for me so i'm guessing the pains were related to my stomach issues or some combination of the drugs I was taking. Focusing on my breathing seemed to get the cramps to subside enough that I was able to put them out of my mind. 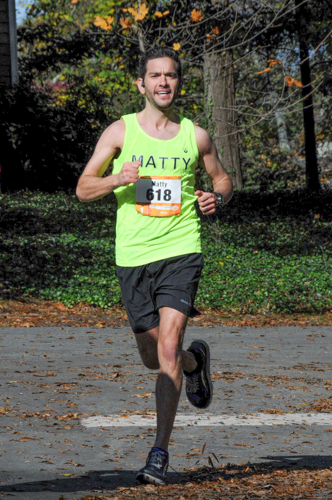 Miles 19-26.2: At this point in the race, I was flying and feeling great. In hindsight, I probably could have been more aggressive with my pace, and could have even broken 3 hours if I had set out to do that from the beginning. With a 3:05 BQ as my goal, I knew that I just had to cruise into the finish to seal the deal and that’s exactly what I did. I wasn't nearly as tired following this marathon as I have been for the others. I'll chalk that up to the adrenaline from running my first BQ, the fact that I underestimated my fitness, and my maturation as a runner. My wife and I celebrated the race in Richmond with a few adult beverages. 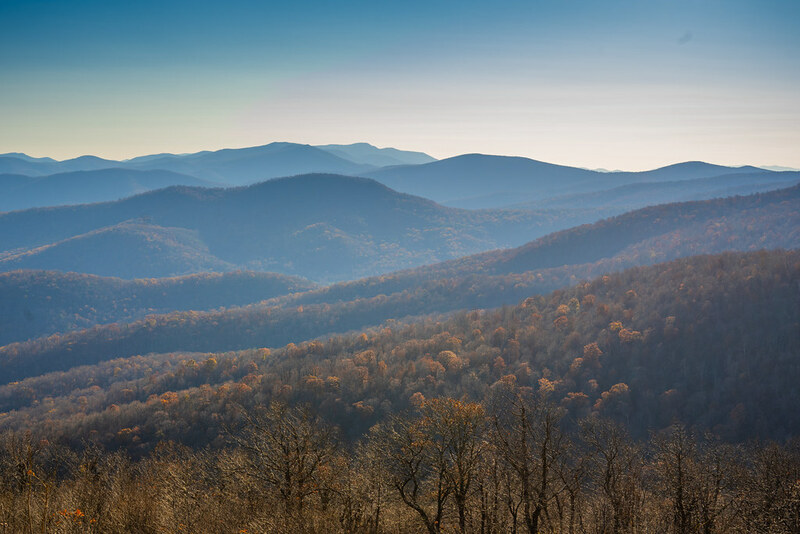 The next day we drove through Shenandoah National park and I even managed to get in a short hike before flying back to Chicago. Reflecting on the success of this race, I don’t think any single change I made was the catalyst for hitting my goal. Rather, as I have gotten older, I have come to respect the sport of running more than I used to. This means reading books on training, nutrition, and anatomy, not expecting unreasonable improvements in fitness, and spending time at the gym to improve muscle strength, balance, and injury prevention. As I did for my previous race report, here are some thoughts on practices that I should start, stop, or continue for my next training cycle. *Pfitz training plans - 18/70 next? I wrapped up my last training run this morning, putting a finish on an 18 week marathon training plan. 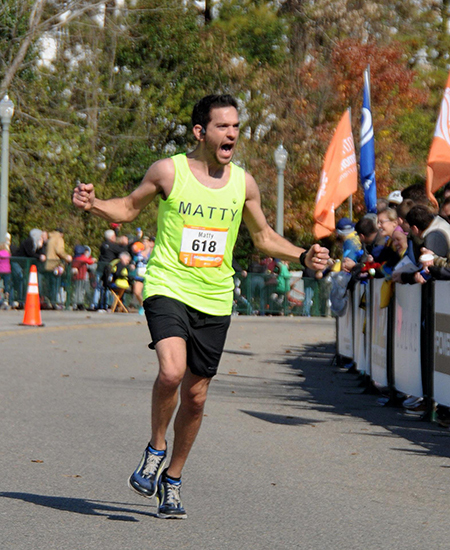 Looking forward to the Richmond Marathon this Saturday. 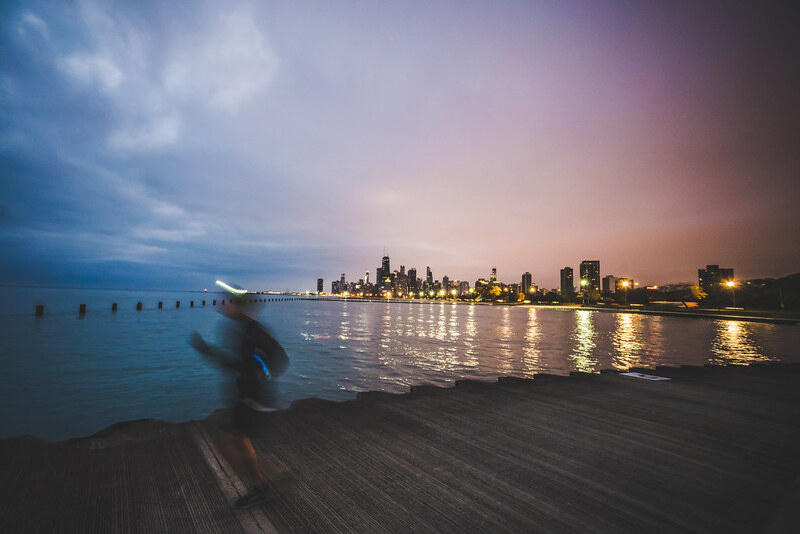 A photo of me running along Chicago's Lakefront during my last training session in preparation for the Richmond Marathon. 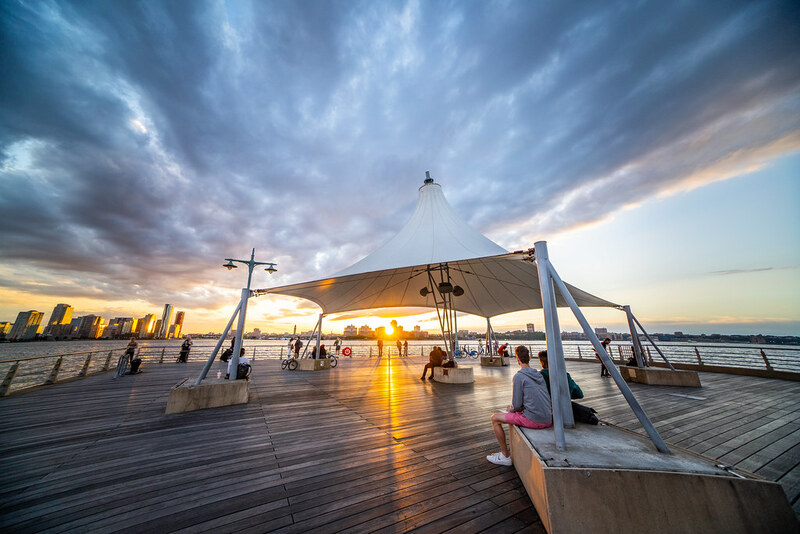 Being able to run along the coast of New York had its advantages on this day as I was able to make stops at almost every pier along the Hudson on New York's west side. One of the challenges of shooting a sunset over water is finding foreground elements to fill the frame. 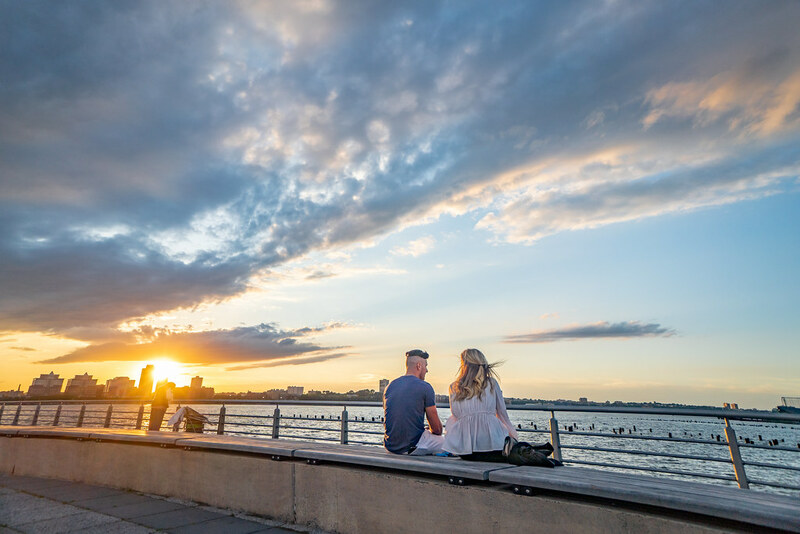 This was a great pier for that, as these wooden dock pillars made for a nice complement to the setting sun over Jersey City. The sunset behind Jersey City from Pier 46 on Manhattan's West Coast. I snagged this shot on my way to the Brooklyn Bridge. I thought I had wrapped up my Manhattan shooting for the night, but as I looked behind me I noticed how One World Trade Center lined up perfectly with this street. Even better, there was a barrier directly behind where I was positioned for this shot, so I was able to stand in the middle of the street without having to worry about the cars behind me. 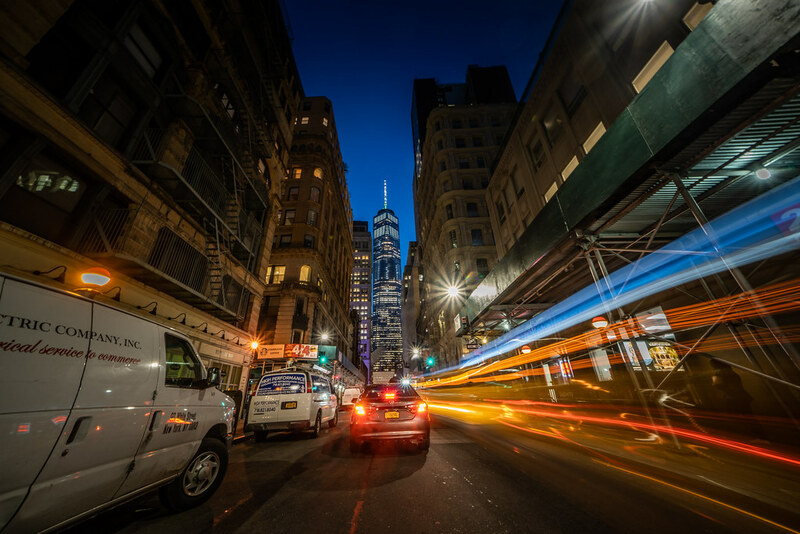 A night view of One World Trade Center from Downtown Manhattan. This is Pier 46 along the West side of Manhattan along the Hudson River. This patch of synthetic grass is used for the various recreational activities pictured. 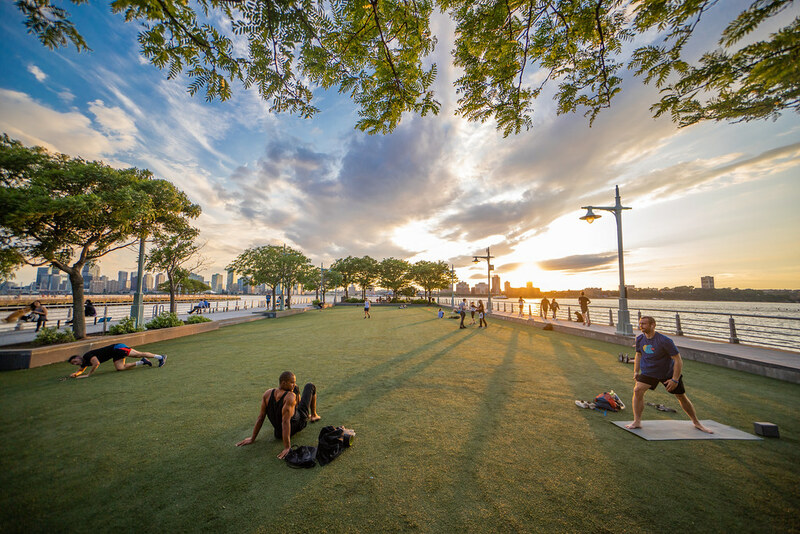 The Pier 46 turf at sunset in Greenwich Village along the Hudson in New York's West side. 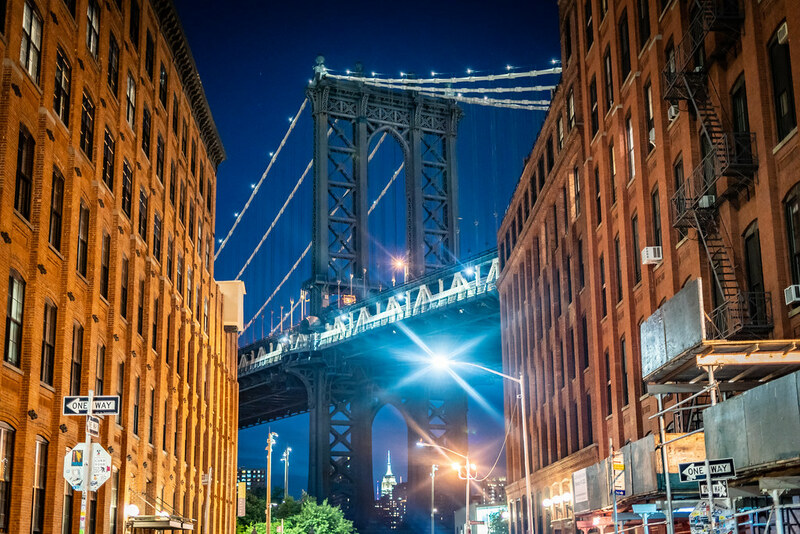 Before I set out on my photo-run from the Central Park area, I had a goal in mind to make it to Dumbo, Brooklyn for this iconic shot of the Manhattan Bridge with the Empire State Building centered below the bridge's tower. I prefer discovering my own compositions as opposed to capturing the famous ones, but I couldn't resist this shot, as the way the bridge, building and street all come together to form this view is pretty unbelievable. My rendition of this famous composition of the Manhattan Bridge from Brooklyn, with the Empire State Building centered below the bridge tower.